When artistic types try their hand at product design, the result can be sublime, as Chevalier Édition demonstrates with its second collection. 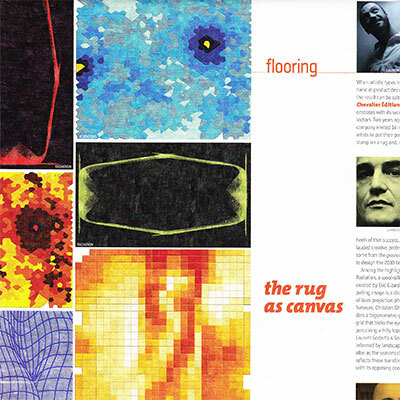 Two years ago the company invited 14 renowned artists to put their personal stamp on a rug and, on the heels of that success, asked 13 lauded creative professionals—some from the previous roster—to design the 2010 line. Among the highlights is Radiation, a wool-silk blend created by Eric Gizard; his compelling image is a distortion of laser projection photos. In Network, Christian Ghion renders a trigonometric graph–like grid that tricks the eye into perceiving a hilly topography. Laurent Godart’s 4 Seasons, informed by landscapes that alter as the seasons change, reflects these transformations with its opposing cool and warm tones. Equal parts photorealism and pointillism, Stephan Lanez’s Miroir abstractly captures an encounter with a woman. The latter three designs are wool, handwoven and –knotted.